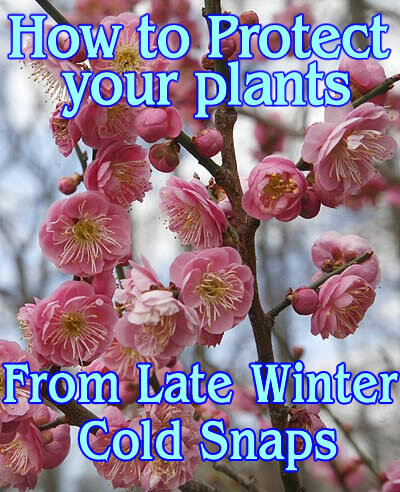 How to Protect your plant from late winter cold snaps. Unusually early plant growth is susceptible to changes in the weather. It’s been an usual winter, the temperatures have been high across quite a bit of the country. Here in the northeast its been in the high 60’s low 70’s for almost a week. The plants think its spring! 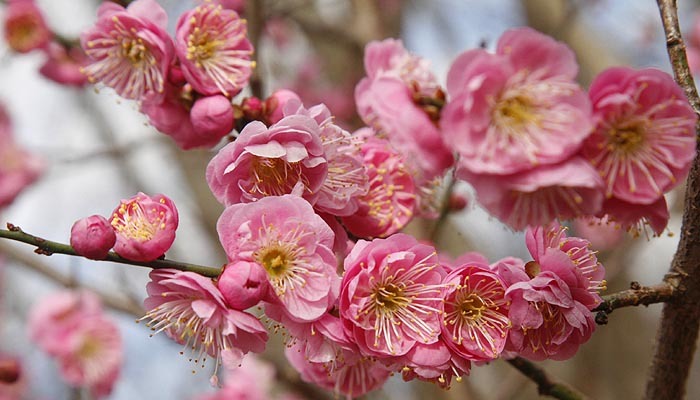 Warm weather brought the lovely Japanese Apricot tree into bloom way to early. Lots of plants are starting to come out of their winter hibernation and starting to show growth. Others are even flowering. For us our beautiful Japanese Apricots are in full bloom. If you have never seen one of these fairly rare trees you are missing out. Their blooms are wonderful. Trouble is this year they think its spring and its not. Blooming in the sunshine of 70° weather is one thing but then the temperatures are going to drop down below freezing overnight. You may have the same problem. Low Ground plants. Close to the ground and showing shoots early can be covered in mulch to keep them warm during the cold temperatures. You may want to move the mulch back again if the temperatures rise again or it will force them higher sooner to get around it. Then you will need more mulch for the next cold snap, it’s a vicious cycle. Medium sized plants that are flowering or budding. If they are small enough cover them with plastic grocery bags. I had to do this one year when we had a late cold snap and all my impatiens were in. The garden was festooned with plastic bags, but hey the plants survived. You can do the same, just cover the plant with the bag weigh it down with a few stones and presto a mini greenhouse. Remove the bags when the temperatures rise. Larger plants can be treated the same way if you have a bag that is big enough. Use plastic garbage bags. Its best to use white or light colored ones DON’T use black ones unless you get the bag off early the next morning. Black will heat up fast and can fry the plants inside if they are not removed. Same will go for transparent ones if they are left in full sunshine. Trees and other large plants. Well if it’s a big tree there is nothing you can do. Our maple trees are flowering but they just have to take their chances there is nothing to do for a big tree. 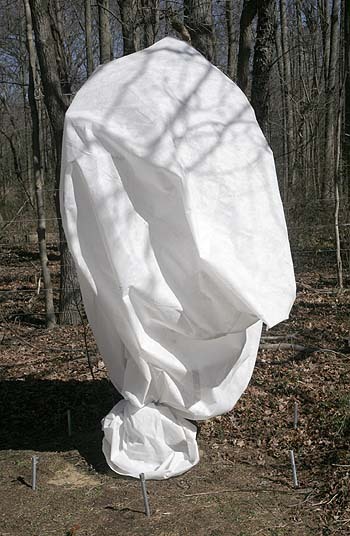 Smaller trees can be covered in fabric. You can buy row covering fabric sometimes called floating row cover. Don’t get the really thin stuff it tears easily and is a waste of money. Get something a little tougher and either wrap the tree or if you have a sewing machine turn it into a large bag that can be dropped over the tree and tied around the trunk. That’s what we did for our apricots. It was a two man job to get the things sown as there was so much fabric it keep trying to pull out of the sowing machine, but with one person holding and the other sewing it was pretty easy. If you are a sewer and intend to do this, use clothes pegs to hold the fabric together not sewing pins, it’s a lot easier to work with. Floating row fabric is fairly inexpensive but you need to buy it in advance so you are ready to use it. Greenhouse megastore has a nice selection. You may need to buy more than you need as it comes in fixed lengths but its fairly inexpensive. Once you have some its easy to get out and use every year and you will be happy you did, its got all kinds of uses to keep the plants warmer in cold snaps or extend the season a little in the fall. Its always good to have some on hand. We buy it by the roll so we have enough to do any job on the farm in a hurry. If you don’t have any row cover any kind of fairly lightweight fabric will do. Old sheets, curtains and such like can be put to use. Its never a good idea to throw out old sheets they can be easily pressed into service as plant covers. We used to do this all the time before we bought real row cover. If you have nothing on hand see if there is an inexpensive fabric store near you. Some Wal-Mart’s still have cheap fabric available. So it might have transformers or ninja turtles on it the plants don’t care. Keep the fabric around it will last for years and keep your plants warm and cozy during cold snaps. Fabric needs to be tightly woven if you can see through it or it has an open weave then it wont do the job. If possible pick a lighter color but any color will do. If you buy a bolt of it you can just wrap it around the tree to cover it all up. I used fabric and old sheets for years before we bought row cover its more expensive to buy fabric but if you need it in a hurry it’s the best option. Now I have too much that needs protection to use fabric and buy row cover by the roll. If it gets REALLY cold. Japanese Apricot tree now wrapped in white plastic to protect it from the late snowfalls and frigid temperatures. Most of the time once plants have begun to flower the temperatures just go down a little below freezing. However if the temperatures go down a LOT then the fabric might not be enough to keep those precious plants warm. Then you certainly need plastic for the job. If you live in an area where there are commercial nurseries you will notice that their hoop houses are all covered in white plastic for the winter months. This is to keep their plant pots from freezing. This is the kind of thing you need to do for your plants. 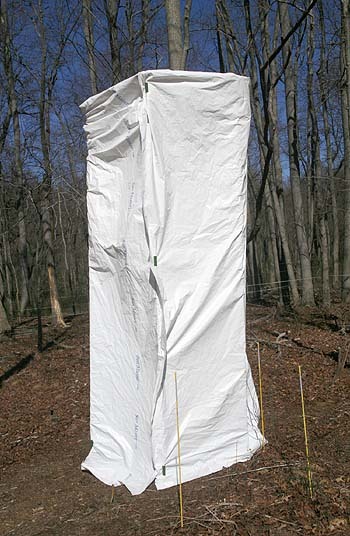 The same methods described above can be used to cover plants in plastic rather than fabric. You need white or light colored plastic to let the light in. Not black the poor plant gets no light, and not clear. Putting the plant in a transparent plastic bag will get it really hot in the sunshine and encourage it to grow and bloom even more. Then it will be really out of sync with the ‘real’ world temperatures and may go into shock if you take the bag off at the wrong time. We use the white plastic left over from our winter hoop house to cover individual trees. This was our first year doing this and our design needs a little more work but it’s a good start. Most years hopefully we wont get such massive swings in temperature as to need to do this. Head to home depot and pick up some of their thin white plastic drop cloths. These are ideal for short term plastic fabric. Ideally you need something a little thicker but they will work well for a while. The major problem is that they are very thin so if the wind blows you could get holes poked in them by plant twigs and branches. If you are covering bushes or small trees make sure that you either take the coverings off when the sun comes out and the temperatures rise or at least open the bags up so that the air can get in and the plant does not get too hot. While white plastic will keep plants a lot cooler than transparent it can still get hot under there when the full sun is hitting it. Remove the covering when temperatures rise to a reasonable night time level, but be ready to put them back on again if the temperatures fall again. With a little care plants can be coddled through this strange weather and come out in spring with no harm done. Author Janice Hazeldine PhDPosted on March 12, 2017 March 12, 2017 Categories Farm work thru the year, garden concepts, Garden work, plants, things to doTags how to protect plants from cold, protecting plants from cold, saving plants from coldLeave a comment on How to Protect your plant from late winter cold snaps.